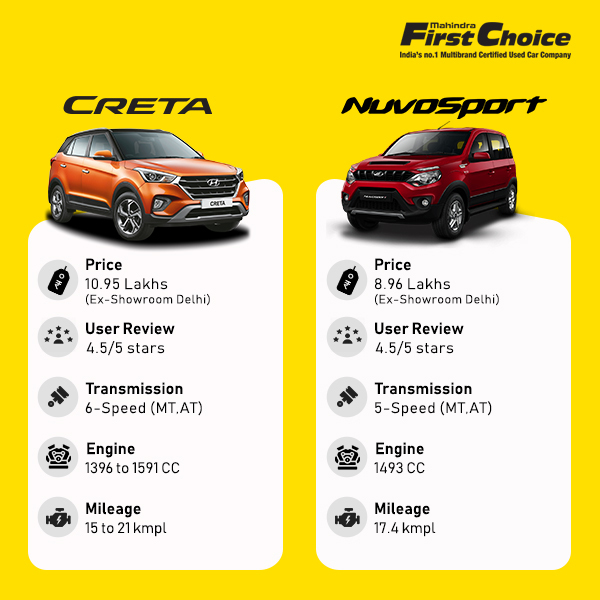 The Mahindra NuvoSport is a fierce rival of the Hyundai Creta and it is thus a difficult job to decide between the two even if the debate is of used cars. Here is a comparative study of the two that might help a car buyer choose wisely. The NuvoSport is powered by a mHAWK100 diesel engine with a 2 stage turbocharger. The displacement of the engine is 1493 cc and it is a 3 cylindered power pack. The maximum power generated by this engine is 100 bhp at 3750 rpm and the peak torque produced is 240 Nm at 1600 – 2800 rpm. The Creta, on the other hand, comes in 1 petrol and 2 diesel engine options. The petrol variant is a 1.6L Dual VTVT power pack with a displacement of 1591 cc and containing 4 cylinders. The maximum power generated is 121 bhp at 6400 rpm and the peak torque produced is 151 Nm at 4850 rpm. Both the cars have FWD drivetrains. The dimensions of the NuvoSport include -a length of 3985 mm, a width of 1850 mm and a height of 1870 mm while that of Creta include – a length of 4270 mm, a width of 1780 mm and a height of 1630 mm. The wheelbase of the NuvoSport which is 2760 mm is longer than that of Creta which is 2590 mm. The Hyundai Creta has a better ground clearance although boot space of the Mahindra NuvoSport is better. The Mahindra car has an independent double wishbone type front suspension with coil springs with anti-roll bar while the rear has a 5 link coil spring suspension. For Creta, the front suspension is a McPherson strut with coil sprint and the rear is a Coupled Torsion Beam Axle (CTBA) with coil spring suspension. The mileage of the NuvoSport is 17.45 kmpl while that of Creta is 15.29 kmpl. Both the cars have electrically powered steering which is adjustable. The Creta has dual airbags for the driver and the co-passenger while the NuvoSport lacks it although both have the seat belt warning. Other safety features of the two cars include – ABS (Antilock Braking System) and EBD (Electronic Brakeforce Distribution). Other features of the two cars include – engine immobilizer, central locking, speed sensing door lock, child safety lock, etc. The Creta has manual AC with rear vents, 2 12V power outlets, tilt steering adjustment, headlight off and ignition off reminder, vanity mirrors on sunvisors for the co-driver only and anti-glare mirrors on the inside. For NuvoSport, there are manual AC with no rear vents, vanity mirrors on sunvisors for the co-driver only, anti-glare mirrors on the inside, cabin boot access and 1 12V power outlet. Both the cars have dual-toned interiors with bench type rear passenger seats, manual front passenger seat adjustments. The seat upholstery for Creta is fabric while that for NuvoSport is vinyl. Creta has driver armrest, while NuvoSport has third-row jump seats and manually adjustable rear passenger seats. Headrests are available in both the cars. Next Why is The New Hyundai Xcent So Popular Among-st Buyers?